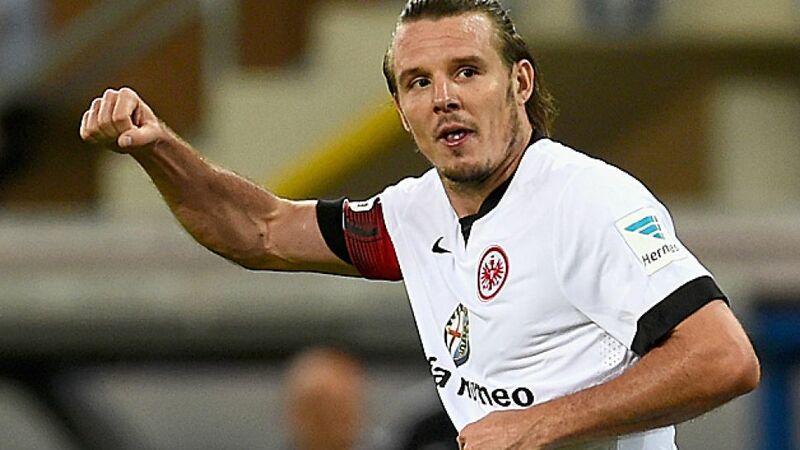 Frankfurt - After playing just 22 minutes of Eintracht Frankfurt’s opening two Bundesliga matches in 2014/15, Alexander Meier’s days at the Commerzbank Arena appeared to be numbered. The 31-year-old, who joined the Eagles from Hamburger SV over ten years ago, was a second-half substitute in Eintracht’s curtain raiser against SC Freiburg and was left out of the squad altogether by Thomas Schaaf for the following game against VfL Wolfsburg, amidst speculation that he might not fit the new head coach’s system. Four months is a long time in football, however, as any seasoned professional is bound to tell you. After 13 games of the campaign, Meier now leads the Bundesliga scoring charts with eight goals in twelve appearances, the latest of which came in the 2-0 victory over beleaguered Borussia Dortmund at the Commerzbank Arena. Not bad for a player who was regarded by many as a square peg in a round hole not so long ago. Once restored to the starting eleven, it didn’t take Meier long to become accustomed to Schaaf’s philosophy. He netted his first of the season in the 2-2 draw at FC Schalke 04 on Matchday 4 and has never looked back since. “I’ve been told not to go searching for the ball as much, so that’s what I’ve been doing,” he told the Frankfurter Rundschau after Sunday’s win over the struggling Schwarz-Gelben. Such is Meier’s club form that there have even been mutterings around Frankfurt of a possible call-up to the Germany squad. After Miroslav Klose’s retirement from international football following die Nationalmannschaft’s triumph in South America, Meier’s name has been mentioned by local papers as a possible replacement for the all-time World Cup leading scorer. With Germany’s next game - a friendly against Australia - just under four months away, though, Meier’s main focus is on Frankfurt and helping the Eagles soar up the Bundesliga table. “We’ve just got to keep collecting points,” said the No14. “It doesn’t matter who has the most goals at the end of the season.” Let’s see if Meier still holds that belief if he’s in with a shout of the Torjägerkanone come May next year.